Think tree houses are a place just for kids to hang out in the backyard? Think again. Treehouse hotels have popped up around the world and we’ve spent the night in several of them now. Not just your typical boring hotel, treehouse accommodation is an experience stay where the hotel becomes the destination. 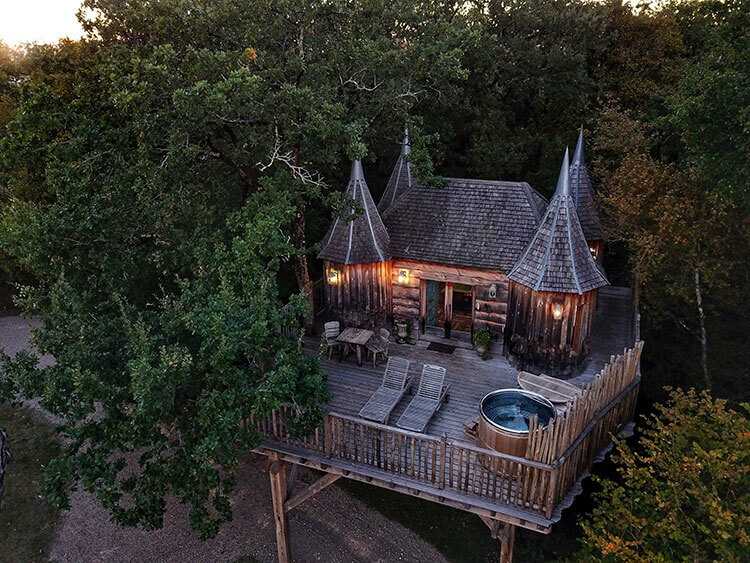 And when your tree house is built to resemble a very real castle of the Dordogne, there’s no denying that these are some of the most awesome tree houses around. Châteaux dans les Arbes, a 26-acre estate in south west France’s Dordogne, is home to four luxury tree houses and two floating cabins each uniquely inspired by actual castles nearby. A stay on the gorgeous resort is sure to be a unique memory from your trip to France. Once upon a time, a mighty fortified castle stood on the Domaine de Puybéton in the Dordogne. Today only a few stones remain of that castle, but it was enough to inspire the owners to rebuild the castle as a luxury tree house and create one of the most unique places to stay in the Dordogne. The tree house resort is aptly named Châteaux dans les Arbes, or the castles in the trees. The tree top accommodation are situated in an oak forest on the estate, surrounded by the unspoiled landscape of the forest and rolling hills of the Perigord. The four luxury tree houses, have all been inspired by real castles of the Dordogne: Château Puybéton, Château Monbazillac, Château Millande and Château Hautefort. In addition to the amazing tree houses, there are two floating cabins that are set on the different ponds of the estate. The floating cabins have their own unique panoramic views and come with resident ducks that live on the ponds. 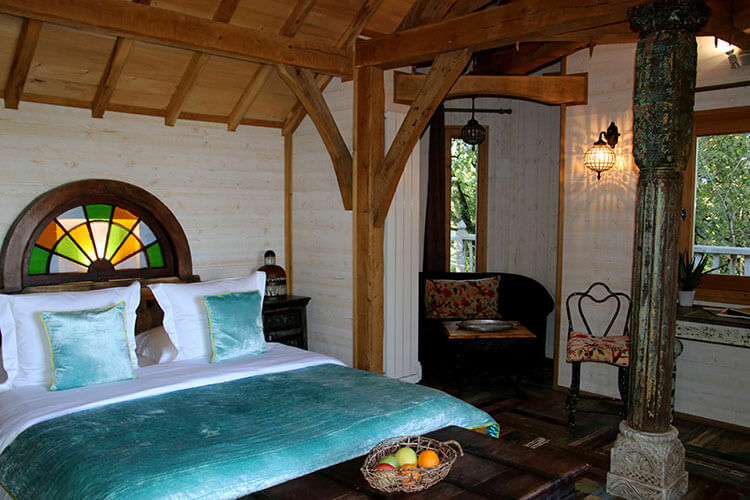 The cabins keep with the theme of the tree house castles and are also inspired by Château Biron and Château Jumilhac. Châteaux dans les Arbes is more than just a treehouse stay. Treehouse holidays here include use of the resort’s heated outdoor swimming pool during the summer months and a variety of activities right on the property from games like table tennis and pétanque to marked hiking paths on the 26-acre estate. It’s also clear that much attention to detail was paid with the landscaping, giving guests many other outdoor areas to sit and enjoy the stunning views. There’s also plenty to do nearby in the Dordogne with over 100 kilometers of hiking and biking trails to explore, the famous Bergerac vineyards beckoning you to visit, medieval villages of the Dordogne luring you in, and scenic kayaking on the Dordogne river to cross of your bucket list. The tree house hotel staff can even help organize horseback riding tours, quad bike tours, hot air ballooning and sightseeing flights. You’re immediately struck by the beauty of the place when arriving at Châteaux dans les Arbes, through the tree houses themselves aren’t immediately visible. And if you weren’t already over-the-moon excited to stay in a treehouse, catching a glimpse of the floating Cabane Biron shoots the excitement level immediately up as you drive past on the way to reception. Only the floating Cabane Biron sits toward the front of the estate, and the rest remains hidden like a surprise waiting to be revealed. All of the tree houses are tucked away in an oak forest, with many of the trees more than 100 years old. The four tree house castles are accessed from a wooden platform walkway that winds through the forest and past each of the tree houses. The tree houses have been nestled among that trees so that none of the oak trees had to be cut down to accommodate them. All sit at least 10 meters (approximately 30 feet) off the forest floor, giving you feeling of being right in the treetops. Cabane Puybéton and Cabane Monbazillac and built to provide romantic treehouse getaways for two, each with one bedroom, a sitting area, full bathroom, and either a jacuzzi or Nordic bath. Château Puybéton has a separate walk-in shower in the tower, as well as a bath. There’s a mini bar and amenities like a Dolce Gusto coffee machine and kettle. Both Cabane Puybéton and Cabane Monbazillac are designed to be an adult treehouse to snuggle up with a special someone in. Cabane Hautefort is the largest and more like a tree house lodge, with three separate bedrooms that can accommodate up to six people. It also has a full kitchen complete with oven and cook top, an American-sized fridge and all the cookery and utensils you could need for self-catered treehouse vacations that include the entire family. Cabane Millande is perfect for a family of 3-4 with two separate bedrooms set in each of the tree house’s towers. The kid’s bedroom has bunk beds and there’s the same mini bar and amenities of the 2-person cabins. Each of the cabins are uniquely decorated, but all have all the comforts of home from heating and air conditioning to wifi and satellite tv. No matter which of the cabins you choose, they are all a treehouse with hot tub or Nordic bath. We stayed in Cabane Monbazillac, which is set at the very edge of the oak forest. It’s the highest set of tree houses and has an additional spiral staircase leading up to it from the walkway. Just like the real Château Monbazillac, which we visited on the trip, it has a set of imposing doors to open up making you feel like you’re entering a real medieval castle. The interior is decorated in exotic, bright colors and fabrics that make you feel as though you’ve traveled to the far east. There’s a separate little sitting area perfect for curling up with a book in one of the towers, a little table for two for breakfast or dinner, a walk-in shower with rain shower head and a separate closet for the toilet. The large terrace looks out over the parkland and the pasture where the resident horse and cow graze. There’s a Nordic bath and it’s situated on the corner of the terrace so that the clearing provides a view of the million stars that twinkle at night. Breakfast is included and you select from a few options when checking in at reception. A picnic basket is hung on a pulley system at each tree house at your agreed-upon time in the morning. There’s a baguette and warm croissants, meats, cheeses, choice of flavors of yogurt, choice of juice and choice of hot beverages like coffee, tea or hot chocolate. 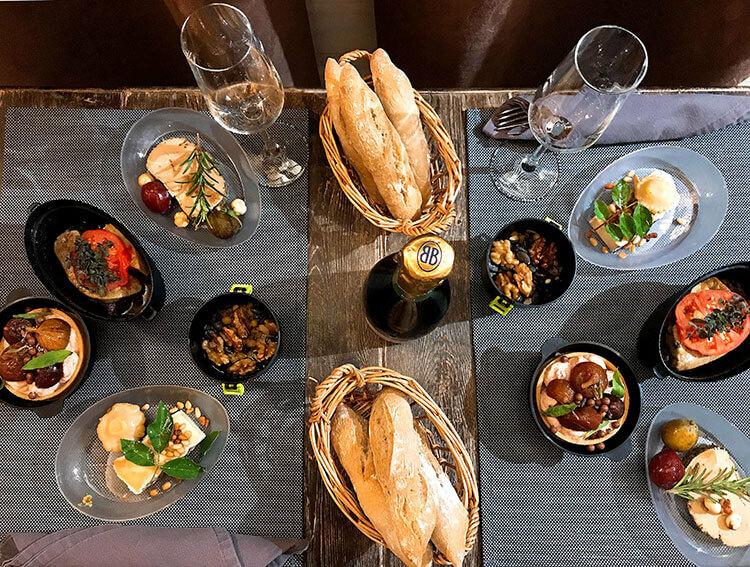 You can also order a dinner of local Perigord specialties prepared by chef Vincent Lucas of Etincelles Restaurant in nearby Sainte-Sabine-Born. And we did just that, dining on foie gras with Monbazillac and seasonal fall accompaniments of walnuts and figs, a beef so tender it practically melted in our mouths and a cheese plate and fig tart for dessert. Châteaux dans les Arbes leaves you wanting for nothing. 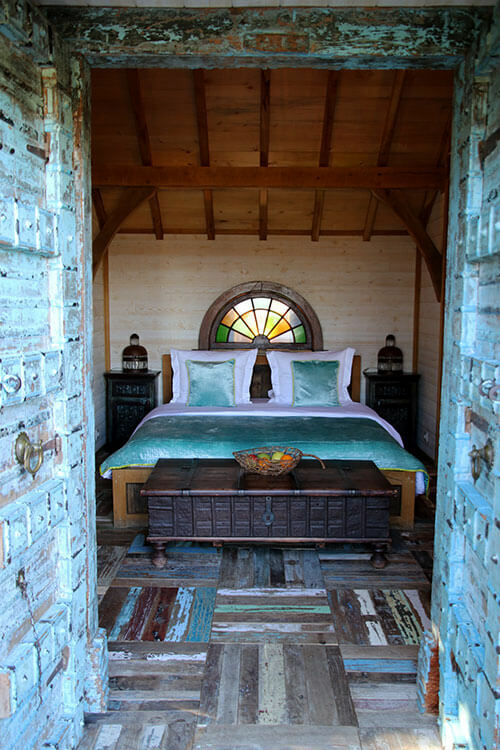 You can even book in-tree house massages by a professional masseuse or order romantic touches like rose petals, chocolate covered strawberries and champagne. You won’t even have to schlep your bags to your tree house; a golf cart service is provided to every guest at check-in and check out. All the comforts of home and then some provide a truly relaxing and unique stay in some of the best tree houses in the world. Châteaux dans les Arbes is located in Nojals-et-Clotte, which is 22 miles from Bergerac and 100 miles from Bordeaux. Bergerac Airport is the nearest airport. Renting a car is best to explore this more remote part of the Dordogne. We recommend staying two nights to really experience and enjoy Châteaux dans les Arbe and the surrounding area. Discover the tree house accommodations and book on their website. Our stay at Châteaux dans les Arbes was in partnership with Dordogne Périgord Tourisme in order to bring you this story. However, Luxe Adventure Traveler maintains full editorial control of the content published on this site. As always, all thoughts, opinions, and enthusiasm for travel are entirely our own. The tree houses do look stunning – and somehow quintessentially french with a good sprinkling of fairydust. I’d love to stay. And I HATE the idea of glamping – this is just something quite different! Oh my! I had my honeymoon in a treehouse in Zamvianga, Philippines, about 50 years ago. But it wasn’t luxurious like these! Would love to stay in Cabanne Montbazillac! OMG this sounds amazing! The tree houses are beautiful, and how cute that you pull up your breakfast to enjoy in the tree tops! Horse riding and hiking through the forests is my idea of heaven, and I would love to try the hot air balloon too – what a place!! What an incredible experience, staying in a tree house. I love the special touches of the cozy room and the picnic basket breakfast 🙂 Hiking, biking and soaking in that beautiful pool sounds like pure bliss. As a huge foie gras fan, I’m totally salivating reading thinking about foie gras from Perigord and Monbazillac. Yum! Great experience, definitively worth looking into it further. I don’t live far from the Dordogne and had read about these tree houses at Châteaux dans les Arbes! They look so cute – I would love to visit. Cabane Hautefort sounds like the perfect treehouse for a family gathering. And I love the idea of the picnic basket on a string outside in the morning! Tree houses I get! But tree houses that look like a castle…amazing. The interiors look so warm and nice. And it must be nice to wake up to the sound of chirping birds. Good to know that there are so many hiking trails around.